Happy Independence Day, America! Not bad for 235 years old. During World War II, there were tons of patriotic superheroes popping up. The first was The Shield but Marvel’s Captain America was the big hit that brought the parade of copy cats and twists on the theme. The first issue of Captain America Comics famously featured Cap slugging Adolf Hitler months before the US officially entered the war. Although there had been plenty of tactical and policy support from the US, a lot of Americans were against getting involved. 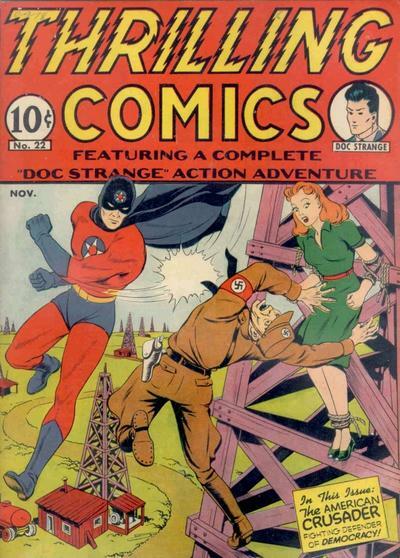 The American propaganda machine was revving up to win support for active participation, and the use of a real world villain like Adolf Hitler in the still-young superhero comic was unique. Comic books had never taken such an overt political stance on current events. The comic was a huge hit and soon the original hits Superman, Batman and Captain Marvel were following Captain America’s lead. Within months, every superhero ever was a dyed-in-the-wool patriot, even characters who had no reason to fight so passionately on behalf of the United States, like the undersea hero Namor the Sub-Mariner. Here’s a parade of some of the flag-themed heroes during those times. Happy Fourth!